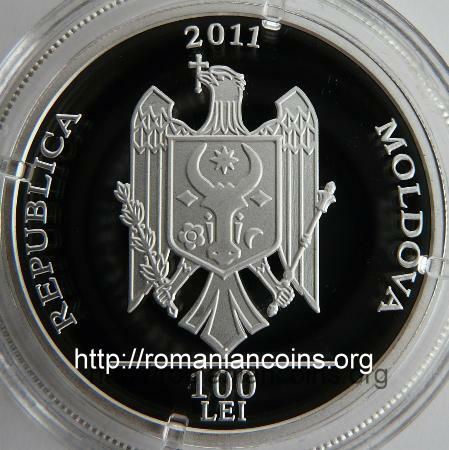 year 2011, circular inscription REPUBLICA MOLDOVA meaning "REPUBLIC OF MOLDAVIA" and the coat of arms of the Republic of Moldavia, in exergue horizontal line and denomination "100 LEI" an old picture of Chişinău, with Măzărachi Hill, inscription "CHIŞINĂU 575 ANI" meaning "CHIŞINĂU 575 YEARS"
The coin belogs to the Historical events series. Chişinău was mentioned for the first time in a document from the 17th of July 1436, document through which Ilie voivod and Stephen voivod, rulers of Moldavia, gave and strengthened to Vancea the logothete, "for his rightful and faithful service", several villages on Răut, Ichel and Bîc Rivers: "[...] and near Bîc, on the other side, on the valley that fall against the Cheşenău of Acbaş, at the fountain where the Tartar deserted settlement is, against the grove." In 1936, when Ion Costin was mayor of the city, 500 years since the first documentary mentioning of Chişinău were celebrated inside the Romanian state. The next documentary mentioning is dated in 1466, from Stephen the Great. In 1966, during the Soviet occupation period, in the Moldavian SSR 500 years since the first documentary mentioning of Chişinău were celebrated again, based on the document from 1466. During the first Moldavian rule of George Ducas (1665 - 1666) Chişinău was already a borough. Most probably its transition from village to borough took place during the rule of Eustratie Dabija (1661 - 1665). Later Chişinău became property of Balica monastery from Iaşi (nowadays Frumoasa monastery). Around 1800 the town belonged to Galata monastery of Iaşi. During the times of Dimitrie Cantemir Chişinău was a small town . In Descriptio Moldavie it is mentioned that in the county of Lăpuşna lay "... Chişinău, a small town of lesser importance, placed on Bîc River." After the seizure of the Moldavian lands between Prut and Nistru Rivers at 1812 by the Russian Empire, they chose Chişinău - strategically placed in the middle of the newly created province of Basarabia - was chosen as capital city of the occupied region. From that time until today the town was developed continuously. 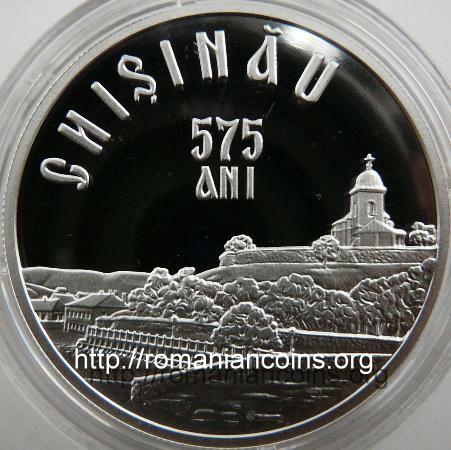 Nowadays Chişinău is the largest city of the entire Moldavia, and the second largest Romanian town after Bucharest. In which the name of the city is concerned, the origin of the word is not fully understood even today. Several hypotheses exist: it can come from the word kesena, that means cemetery in Cuman language (we should note that mazar means tomb in Tatar language! ), or from Tatar words keşen and aul, that mean hermitage and village , . The Romanian historian Constantin Giurescu wrote in Istoria românilor : "The name of the settlement is the name given by the people to a waterfall and is explained, in our case, through a waterfall of Bîc in this place." Mazarache church was erected in 1752, not far from the right bank of Bîc River, by Vasile Măzărachi or Mazarache , a merchant and boyar from Iaşi. The church is an important historical monument - the oldest stone building of the city. 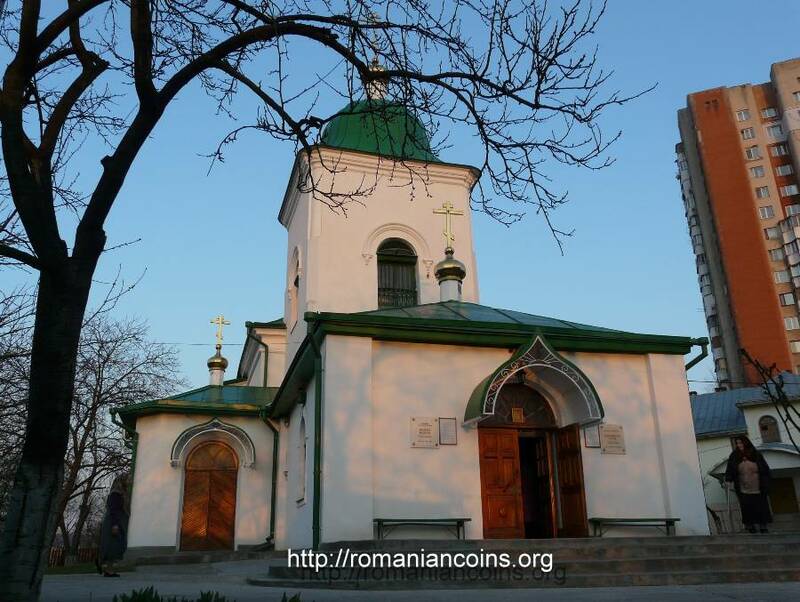 In 2012 the National Bank of Moldova issued a 50 lei coin dedicated to this old church. 1. Boldur A., Istoria Basarabiei (History of Basarabia). Editura Victor Frunză, Bucureşti, 1992. 2. Cantemir D., Descrierea Moldovei (Description of Moldavia). Editura Tineretului, 1967. 3. Giurescu C., Istoria românilor. III. De la moartea lui Mihai Viteazul pînă la sfîrşitul epocii fanariote (1601-1821) (History of Romanians. III. From the Death of Michael the Brave to the end of Phanariot Epoch). Editura BIC All, Bucureşti, 2007 (reproduce ediţia a doua, 1943). 4. ***, Vasile Măzărachi, Wikipedia, January 2012.